The directional solidification (DS) process and as-cast microstructure of a single-crystal (SX) plate casting were investigated through simulations and experiments. Simulations were conducted to optimize the directional solidification process. The mushy zone showed flat and concave morphology at the withdrawing rate of 3 and 6 mm/min, respectively. Based on the simulation results, the directional solidification experiment was performed at the withdrawing rate of 3 mm/min to achieve a preferable microstructure. On the basis of the start block, many newly formed grains appeared due to the chilling effect of the chilling copper plate. With the increase of location height, these grains continuously coarsened and competed, and the grain density gradually decreased. Only a few grains entered into the spiral selector, and only one grain with the orientation close to  preferential orientation could get through it to form the SX structure of the plate casting. From the lower to the upper part of the SX plate casting, the primary dendritic arm spacing first decreased from 467.7 to 435.22 μm, and then increased to 565.81 μm; the secondary dendritic arm spacing increased by 11.4%, from 181.39 to 202.13 μm. The γ′ phases in the dendritic arms showed a cubical morphology, and some micropores appeared near the eutectic particles. The simulated grain structure evolutions conformed well with the experiments. 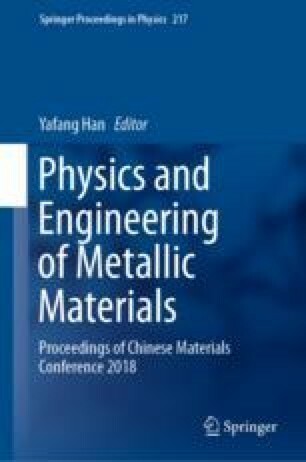 This research was funded by the National Science and Technology Major Project (2017ZX04014001) and National Key R&D Program of China (2017YFB0701503).